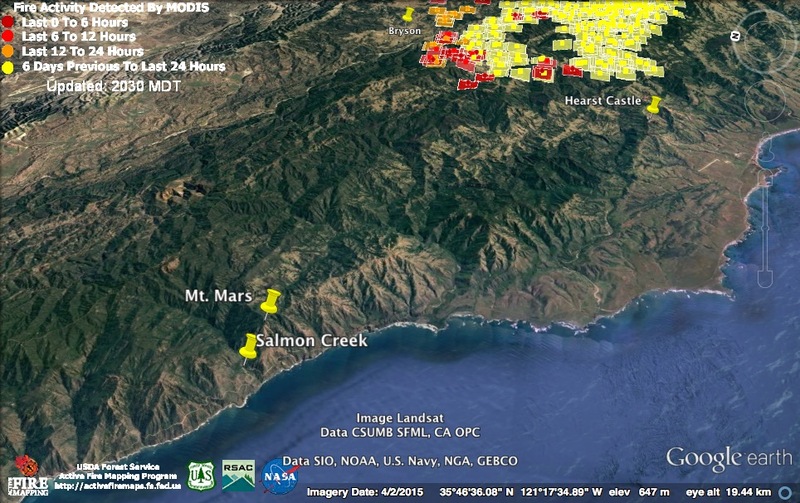 The satellites found two active fire zones on the Soberanes Fire today. 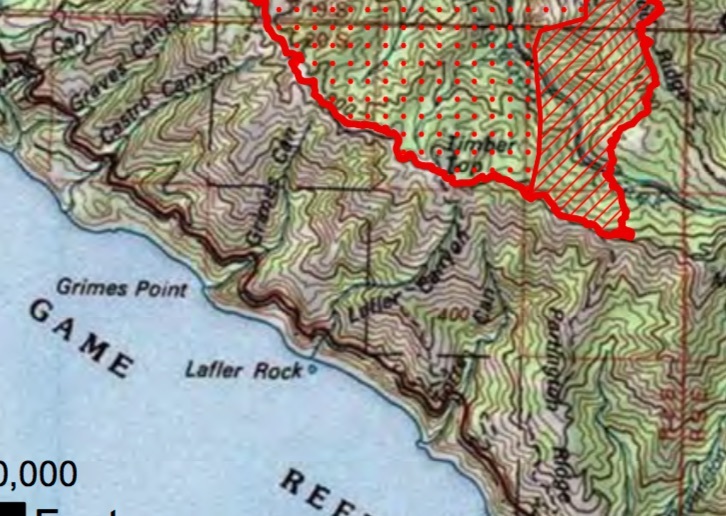 The smaller, on the ridge between the forks of the Big Sur River and the larger stretching from Ventana Mesa Creek, below the Ventana Double Cone, along the southwest side of the Carmel River all the way to Pine Valley. Fire activity seems to have picked up considerably between 12:30 pm, when the light red detections were acquired and 2:00 pm when the dark red detections were spotted. Another day of trouble on the Chimney Fire. This significant northwest expansion was already well underway by 2:00 pm and there were later reports of fire spotting over the lines in this area. The red marker designated “SP Wilderness” indicates the approximate location of the southeast corner of the Silver Peak Wilderness. One more westward push and the fire could easily be there. This evening’s official numbers for the Chimney Fire: 43,933 acres; 41% contained; 49 residences destroyed; 21 other structures destroyed; 8 structures damaged; 1 injury. 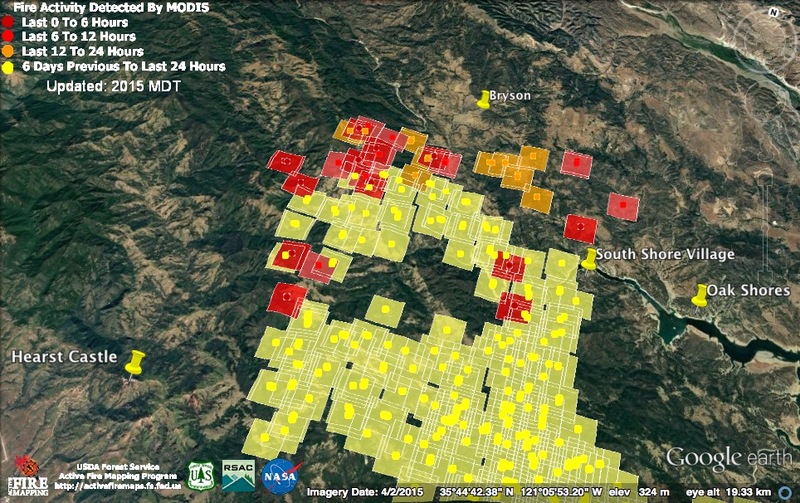 Fire became very active again overnight along the South Fork Big Sur and on the ridge between the Forks. Fire also continued to advance toward Cienega, and to actively burn on the slopes to the west of Round Rock, on the Carmel River. 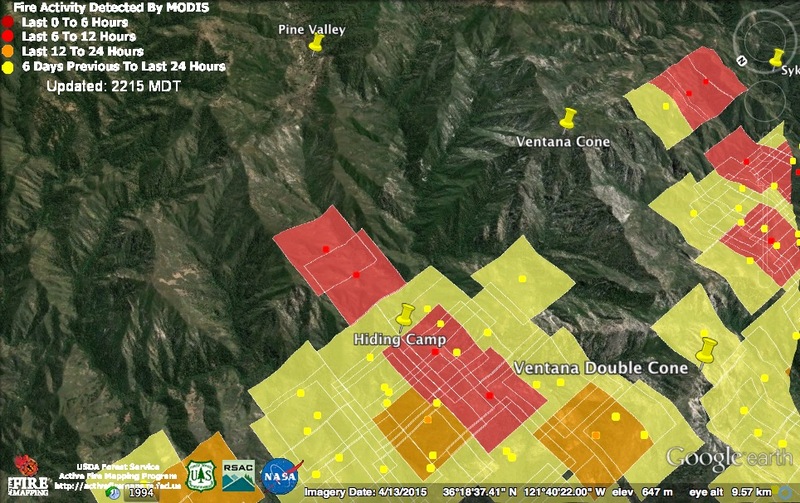 The most interesting new heat detections suggest fire is actively burning near Pine Valley again and beginning to run up Bear Basin Creek toward Bear Basin – and South Ventana Cone. 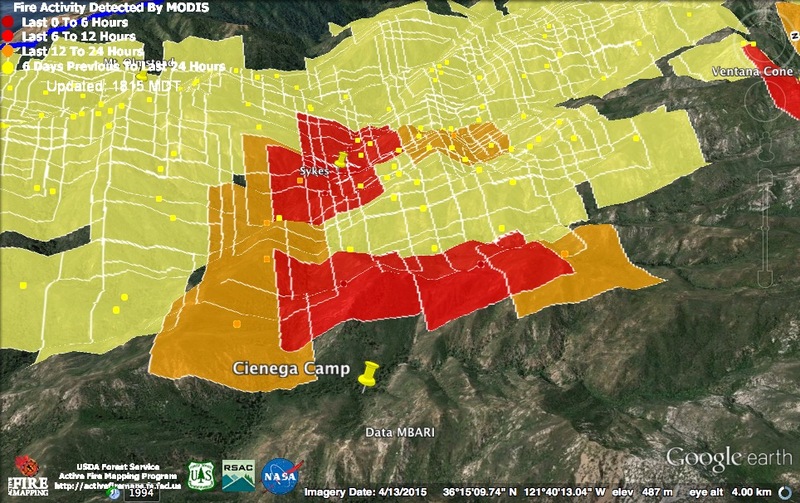 At South Ventana Cone the fire would enter, for the first time, the watersheds of the Arroyo Seco and Salinas Rivers. Heat detections are from around 11:00 pm last night and 3:00 am this morning. This morning’s official numbers for the Soberanes Fire: 90,062 acres; 60% contained; 57 homes and 11 outbuildings burned; 3 structures and 2 outbuildings damaged; 1 fatality and 4 injuries. The Chimney Fire’s big run to the west appears to have laid down during the night, with the fire taking a slower and more northerly course. Afternoon winds causing extreme fire behavior and large runs have been a regular occurrence on this fire. There’s no telling what this afternoon will bring. The official numbers for the Chimney Fire have not been updated this morning. Planes were busy prepping the Coast Ridge south from Cold Springs today in advance of continued firing operations. Active fire, meanwhile, remained deeper in the Wilderness. The biggest run of the day appears to have taken fire from the Carmel River all the way to the summit of Ventana Cone. Heat detections are from around noon and 3:00 pm. 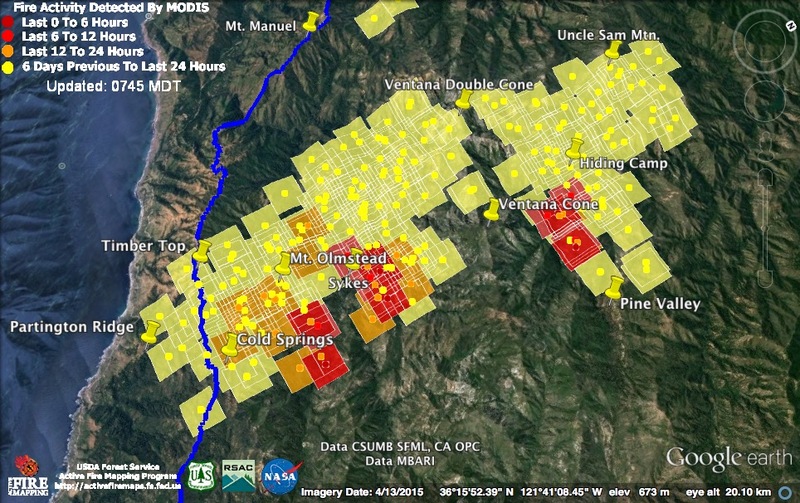 The heat detection furthest to the north was on the slopes of Elephant Mountain, above the Carmel River between Buckskin Flat and Soda Springs. The run up Ventana Cone looks like this. Fire appears to be actively burning over a wide area above Hiding and Round Rock Camps, as well as in the Blue Creek drainage. On the Big Sur River side of the hill, (garbage?) fires were still burning brightly around Sykes and fire was approaching the Cienega Creek drainage and Cienega Camp. 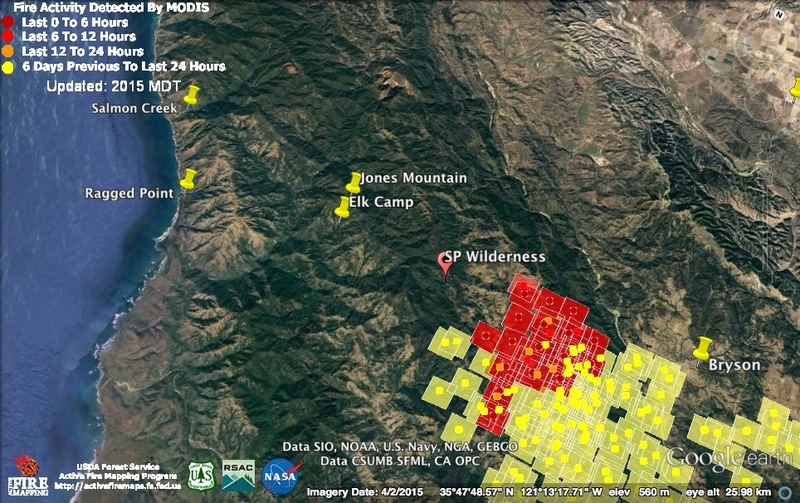 The official numbers have not been updated for the Soberanes Fire this evening. Just when it looked like the Chimney Fire might be winding up, it takes another big run to the west. Cal Fire reports that fire behavior during this run was “extreme,” and notes that Hearst Castle remains threatened. Remember that the fire has likely burned on beyond the position pictured here (which is based on the 3:00 pm satellite pass). The fire is now very close to the San Carpoforo Creek watershed. Elk Camp, in the Silver Peak Wilderness isn’t all that far away anymore, either. This evening’s official numbers for the Chimney Fire: 41,675 acres; 39% contained; 48 residences destroyed; 20 other structures destroyed; 8 structures damaged; 1 injury. With a heavy marine layer in place, the Soberanes Fire continues to take its time. There was still some active burning along Logwood and Lion Creeks, fire appeared to be spreading up the lower slopes of Pine Ridge (near the Pine Ridge/Big Sur Trail junction), there was fire in the Ventana Spires area (near the Ventana Double Cone), and fire continued actively burning downstream from Pine Valley. 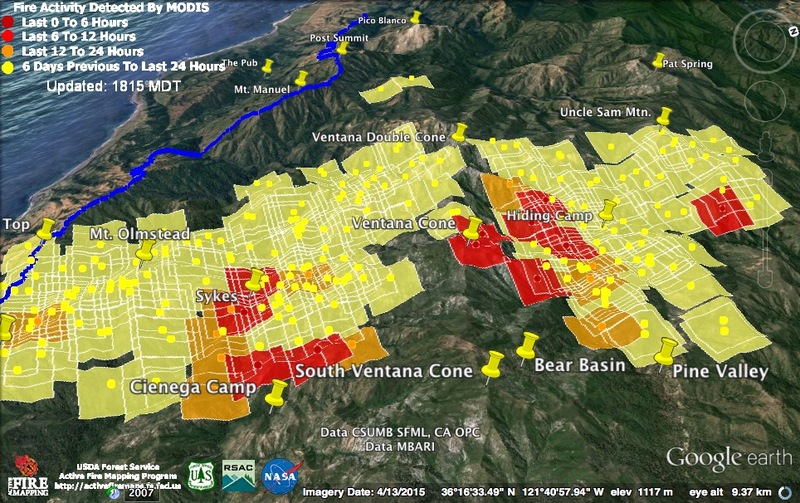 The largest overnight flare up, though, appears to have been along the Big Sur River mainstem and North Fork from somewhere around Sykes up to somewhere a bit downstream of the Cienega Creek confluence. 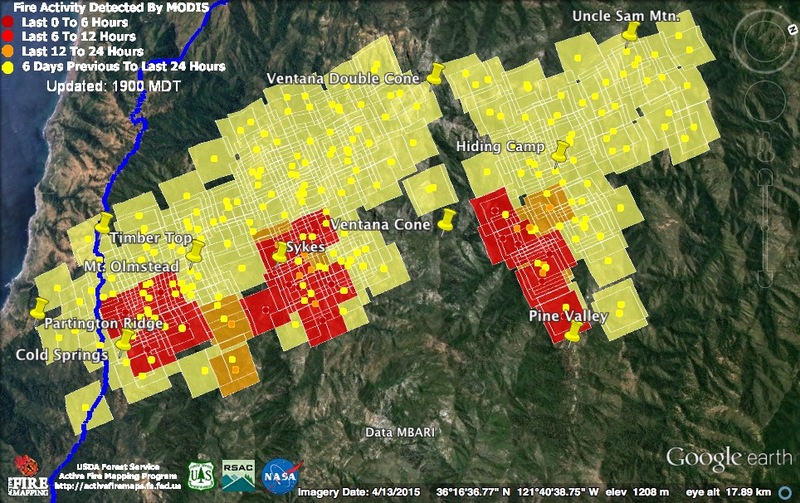 Heat detections were acquired around midnight and 2:30 am. 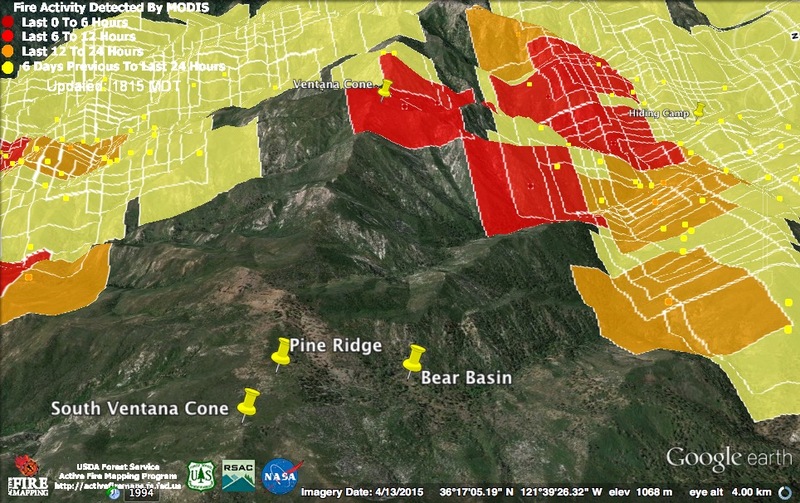 This map shows how fire is now poised to make uphill runs at the Pine Ridge/South Ventana Cone area from both north and south. The marine layer is only expected to get thicker as the week progresses, but this high country should feel it less than lower elevation portions of the fire. This morning’s official numbers for the Soberanes Fire: 88,654 acres; 60% contained; 57 homes and 11 outbuildings burned; 3 structures and 2 outbuildings damaged; 1 fatality and 4 injuries. Finally some good news from the Chimney Fire where, for the first time in days, afternoon winds did not create large runs into new territory. Instead, firing operations made good progress. I don’t know whether the new outbreak of heat on the south end of the fire (where no heat had been detected for many days) is the result of a firing operation, but with the weather getting cooler and damper, there is hope that this fire may be entering its final stages. This morning’s official numbers for the Chimney Fire: 38,956 acres; 39% contained; 45 residences destroyed; 20 other structures destroyed; 7 structures damaged; 1 injury. Today’s satellite passes were pretty close together (a little before 1:00 pm and a little after 2:00 pm) so they don’t provide as complete a picture of the day’s events as usual. What can be seen looks like more of the same. 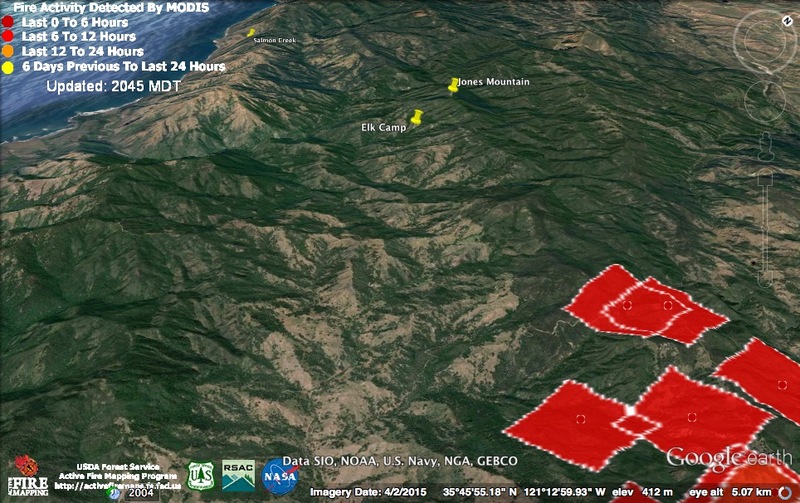 Active fire along Logwood Creek, fire from Lion Creek past Sykes to Redwood Creek, and fire east of the Carmel River from beneath Ventana Cone to Pine Valley. 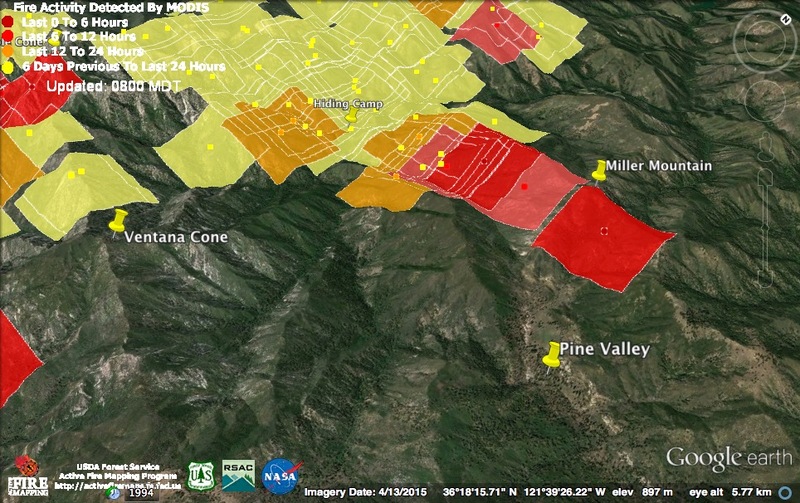 Active fire does appear to be encroaching on Pine Valley again. This time by burning up along the east bank of the river. There were firing operations underway today at the Chimney Fire and, by all reports, they were going well. Perhaps the containment percentage will soon begin to climb. 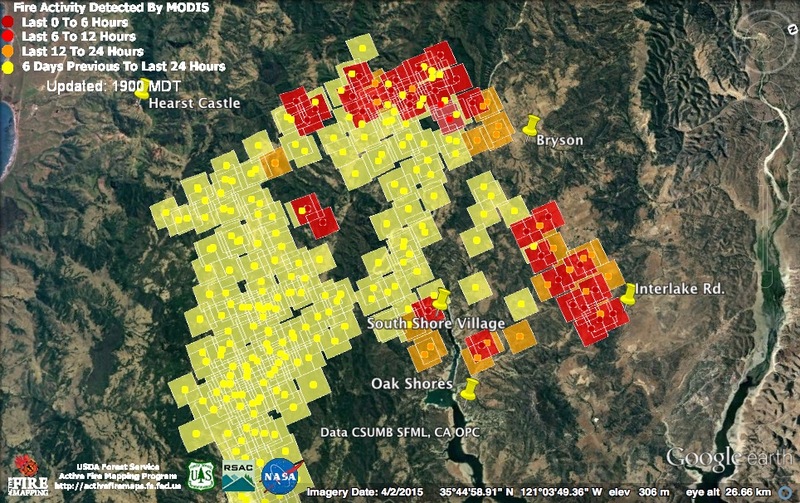 It’s difficult to know which of the new heat detections are the result of firing, but it’s clear that there is active fire on the west again, as well as to the north and east. This evening’s official numbers for the Chimney Fire: 38,956 acres; 35% contained; 52 structures destroyed; 7 structures damaged; 1 injury. 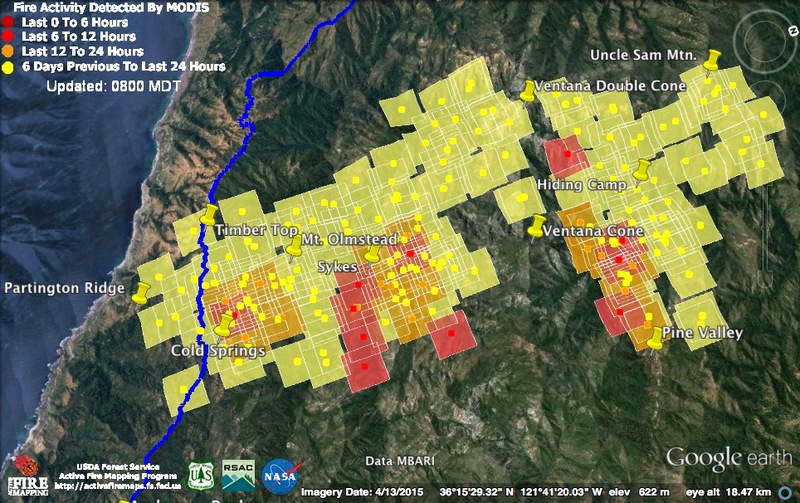 The satellites found three distinct areas of active flame on the Soberanes Fire last night. First, fire was burning along the South Fork Big Sur and may have been beginning a run up the ridge between the South and North Forks. Next, fire was burning along a line stretching from Sykes to Redwood Camp. 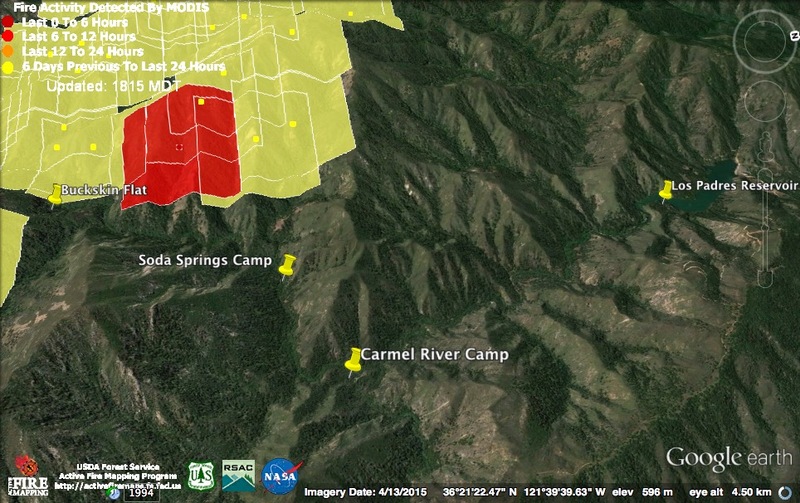 Finally, active burning continued along the east side of the Carmel River downstream from Pine Valley. Light red heat detections were acquired around 11:00 pm; dark red detections around 3:00 am. This morning’s official numbers for the Soberanes Fire: 87,316 acres; 60% contained; 57 homes and 11 outbuildings burned; 3 structures and 2 outbuildings damaged; 1 fatality and 3 injuries. Some of the new heat on the Chimney Fire may well be the result of firing operations but, once again, there has clearly been a lot of growth. While the fire had been expanding to the north and west over the past few days, last night’s expansion was mainly to the north and east. The fire that destroyed additional structures around South Shore Village was still actively burning as of 3:00 am this morning, as was the fire threatening Oak Shores. North of Oak Shores, heat detections place the fire nearly at Interlake Rd. 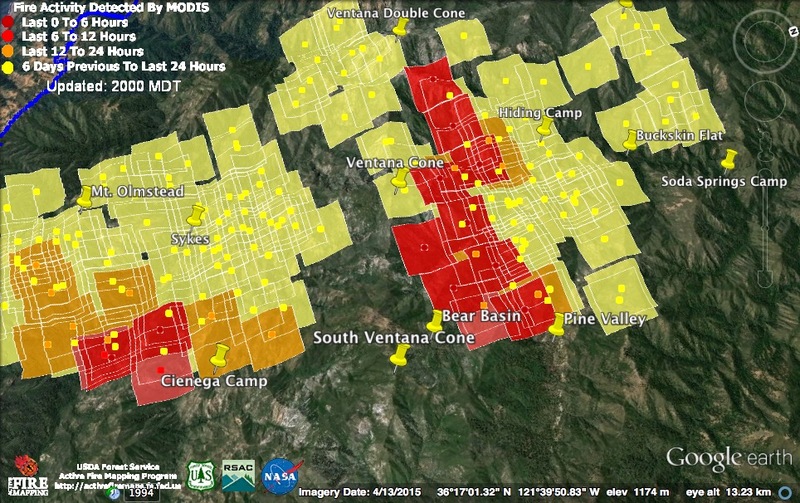 The fresh heat detections in the Bryson Hesperia area were likely, at least partly, the result of firing operations. This morning’s official numbers for the Chimney Fire: 37,101 acres; 35% contained; 52 structures destroyed; 7 structures damaged; 1 injury. 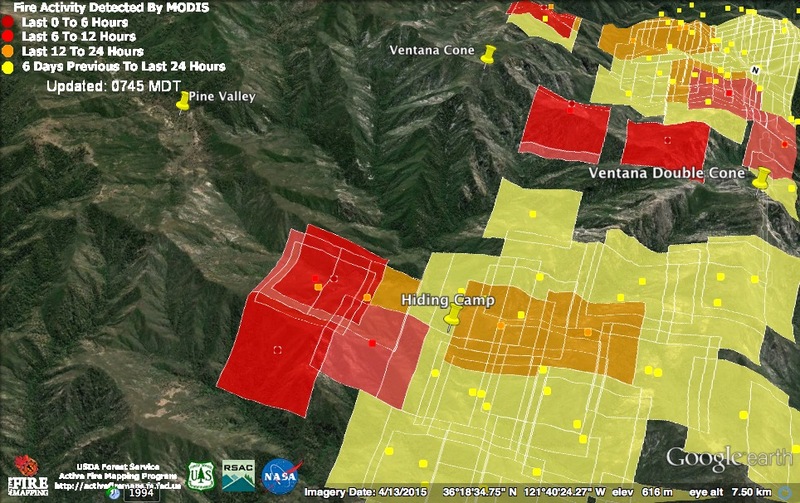 Active fire remained deep in the Ventana Wilderness today. Light red squares were acquired around noon; dark red squares around 2:00 pm. 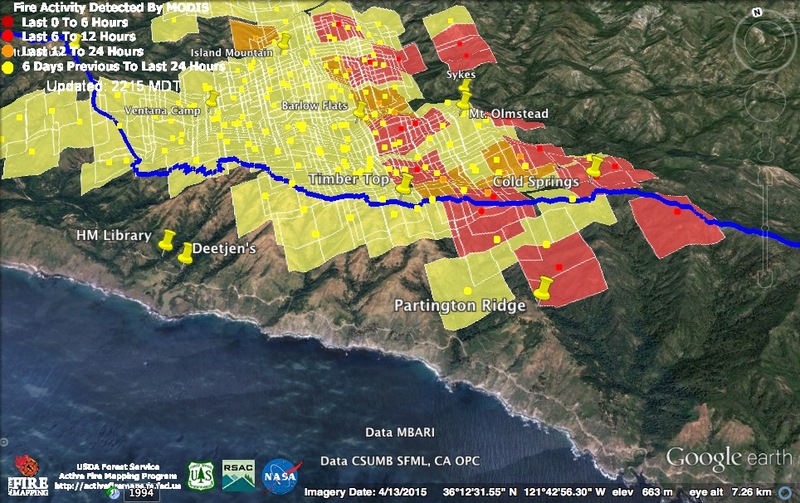 In the Big Sur River watershed, there was continued burning along Logwood Creek, but the biggest new runs occurred along the North and South Forks of the Big Sur River. 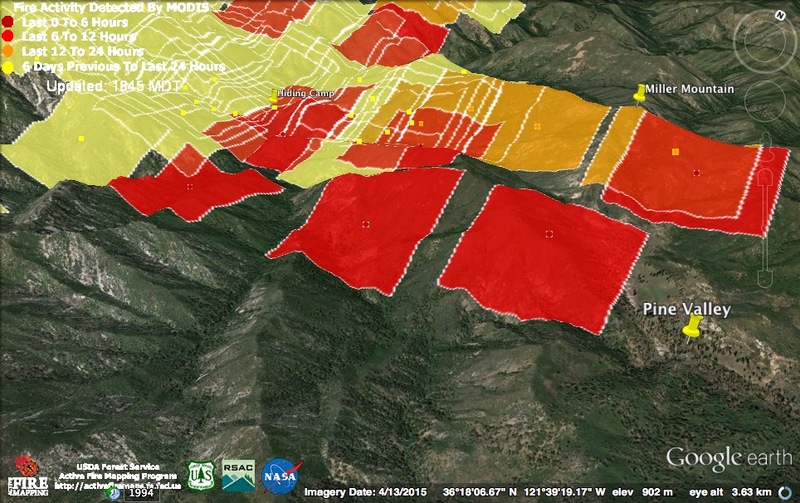 On the South Fork (in the foreground of the map), fire appears to be approaching the confluence with Mocho Creek. On the South Fork, the fire front appears to have reached the Redwood Creek confluence. 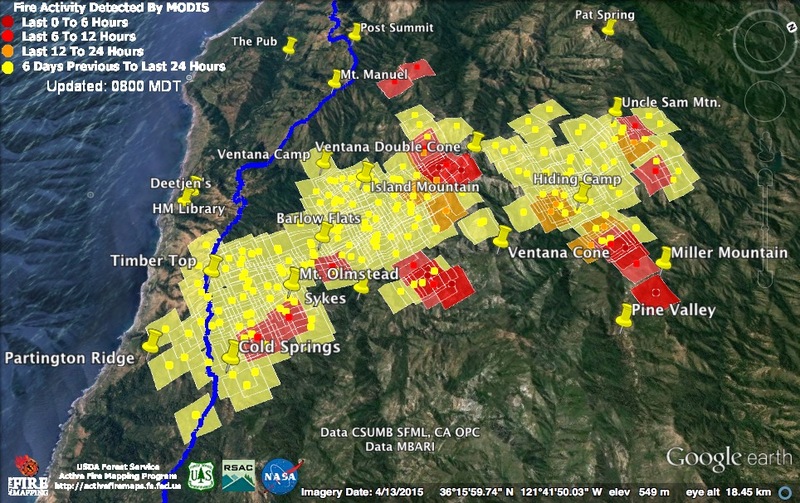 On the Carmel River side, there were no new heat detections in Pine Valley or further to the east. Instead, fire was concentrated further downstream, near the Blue Creek confluence. This evening’s official numbers for the Soberanes Fire: 86,294 acres; 60% contained; 57 homes and 11 outbuildings burned; 3 “structures” and 2 outbuildings damaged; 1 fatality and 3 injuries. At the Chimney Fire, the situation remains bad. Today’s heat detections suggest fire is spreading north, east and west. There were no new heat detections near South Shore Village as of 2:00 pm, but later in the day structures were reported to be burning as the fire made a run in the area. There are reports this evening that the fire has moved closer to Oak Shores, but that firefighters have succeeded, so far, in keeping it out of the community. I’m including this view to give an idea of where the Chimney Fire is in relation to Big Sur’s South Coast and the Silver Peak Wilderness. This evening’s official numbers for the Chimney Fire: 33,173 acres; 35% contained; 52 structures destroyed; 7 structures damaged; 1 injury. 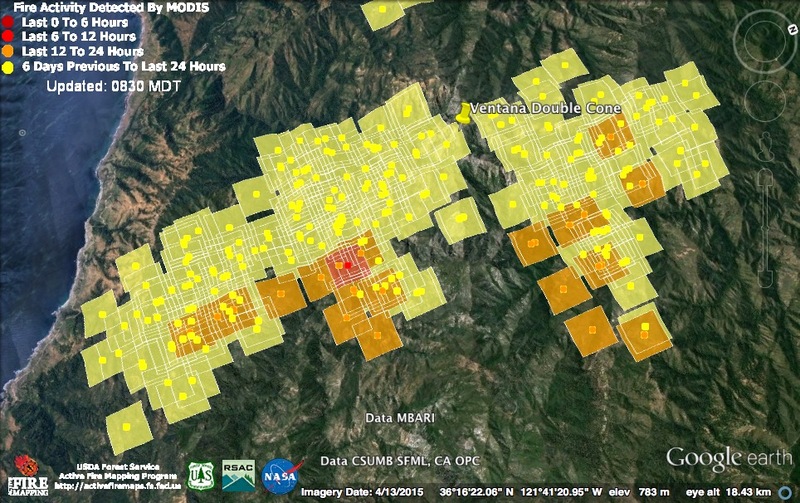 The Soberanes Fire appears to have had a quiet night with very little active burning. 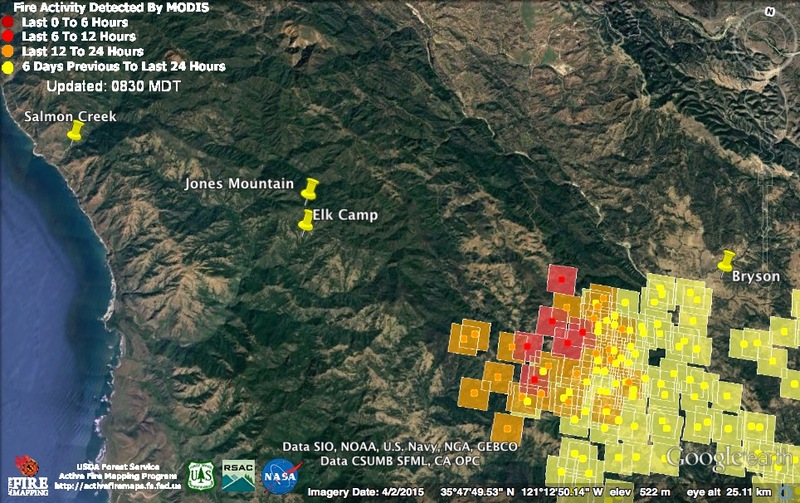 The satellite passes took place around 10:00 pm and midnight, though, so any increase in burning in the early morning hours (which has often occurred on this fire) would have been missed. This morning’s official numbers for the Soberanes Fire: 86,294 acres; 60% contained; 57 homes and 11 outbuildings burned; 3 “structures” and 2 outbuildings damaged; 1 fatality and 3 injuries. The Chimney Fire, on the other hand, had a very active evening, taking off to the north toward Bryson. This morning’s official numbers for the Chimney Fire: 31,644 acres; 35% contained; 48 structures destroyed; 7 structures damaged; 1 injury. Things stayed calm on the Coast Ridge today, but remained active further back in the hills. New heat detections were acquired at around 11:00 this morning and 2:30 this afternoon. 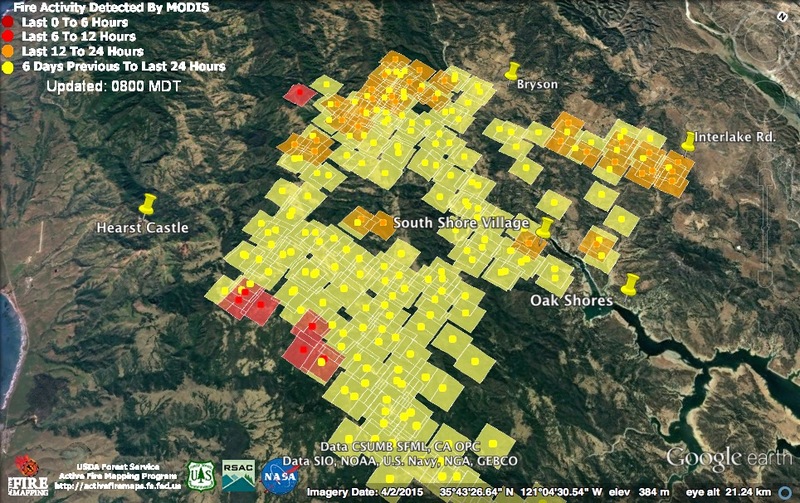 A lot of fire was still burning between Lion Creek and Redwood Creek and it has continued spreading east – possibly even crossing Redwood Creek upstream of Redwood Camp. Down on the Big Sur River, fire was also approaching (and may even have burned through) the wildly popular Sykes Camp. At least that should clean out some of the garbage. 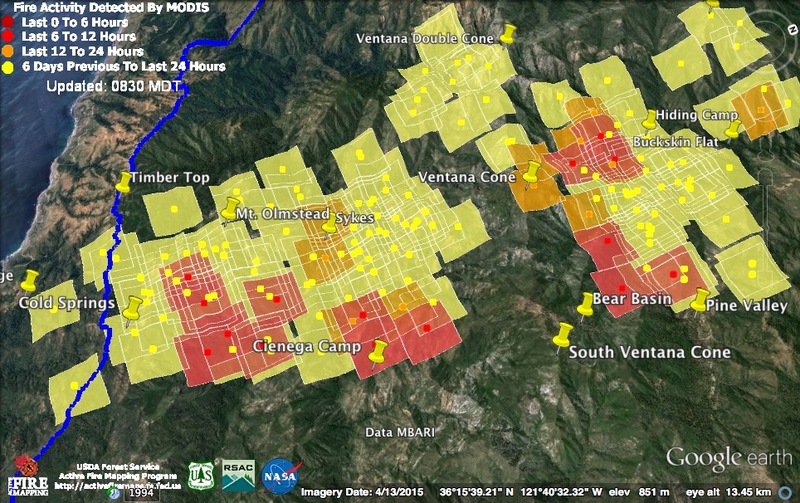 East of the Carmel River, fire also continued to spread, moving both east, along the ridge from Miller Mountain, and south, into Pine Valley and into the canyon between Pine Valley and Round Rock. Back on the west side of the river, fire was beginning to climb the lower slopes of Ventana Cone. 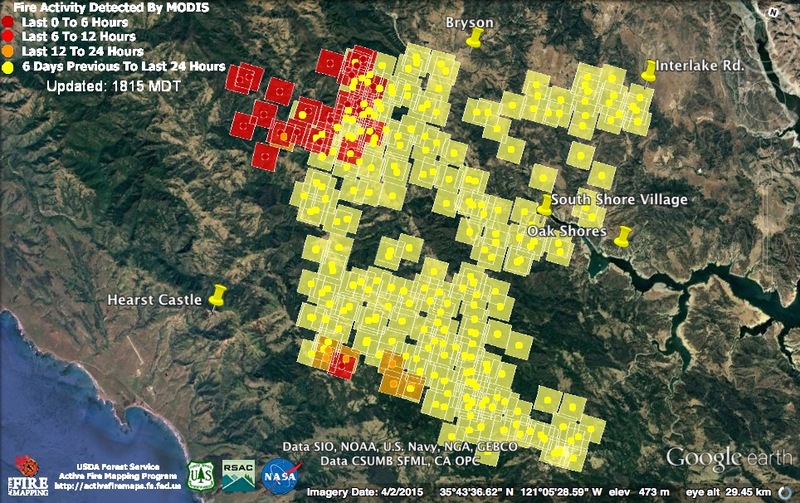 Yesterday’s big break out, on the Chimney Fire, continues to expand both north and west. 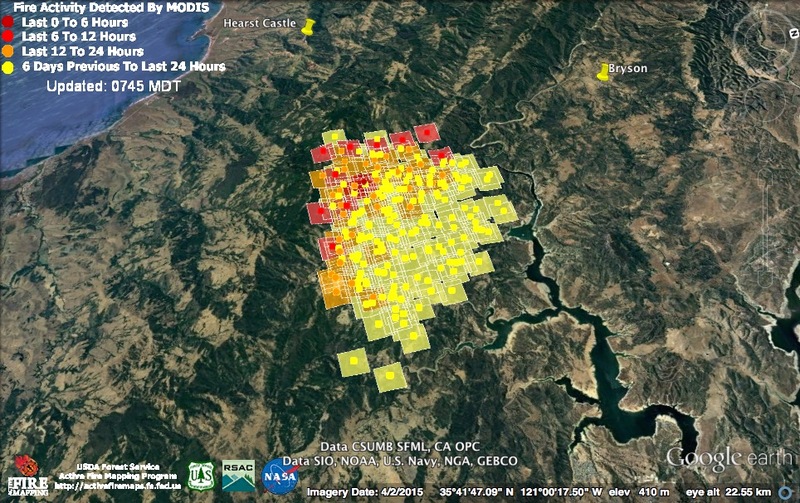 The bulk of the fire is clearly west of the Nacimiento River, which is good news for Bryson and the lake shore communities, but it is aimed straight at the southeast corner of the Silver Peak Wilderness. Let’s hope it can be stopped before it gets there. This evening’s official numbers for the Chimney Fire: 27,546 acres; 35% contained; 48 structures destroyed and 7 damaged; 1 injury. 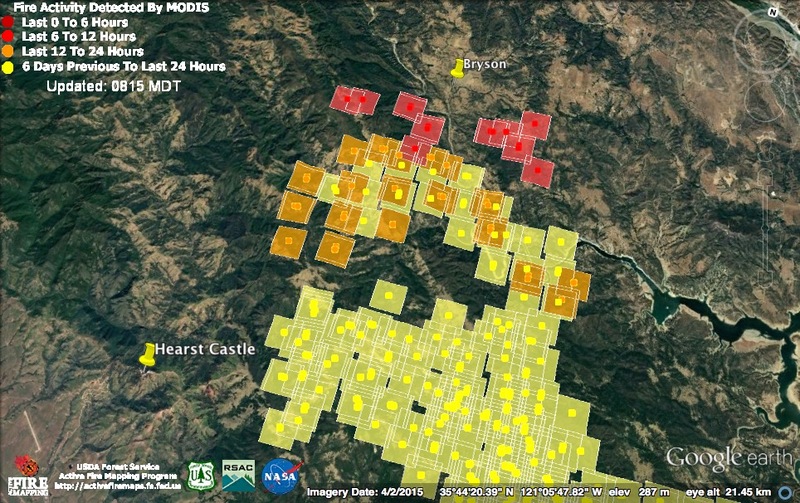 The light red squares represent heat detections acquired around 11:30 last night. The dark red squares were acquired around 3:00 am this morning. The heat detections off to the west behind Mt.Manuel, indicate a flare up of unburned material on Launtz Ridge; an area the fire front passed through more than a week ago. Flare ups like this, within the fire perimeter, should be expected for many weeks to come. As expected, the fire east of the Carmel River has run right over the top of Miller Mountain and, at 3:00 am this morning, was backing into Pine Valley. It can be expected to continue along the high ridge from Miller Mountain all the way to China Camp, on the Tassajara Rd. (still some distance away). 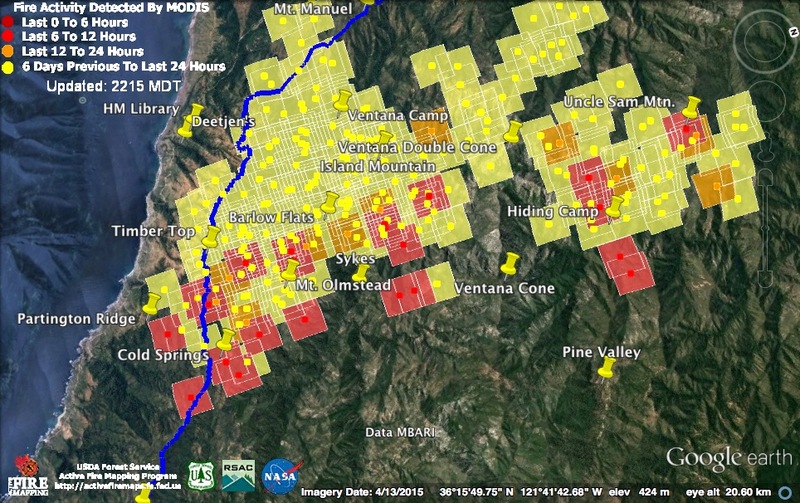 The other big eastward surge during the night brought fire out of the Lion Creek drainage and into the headwaters of Redwood Creek, below Ventana Cone. 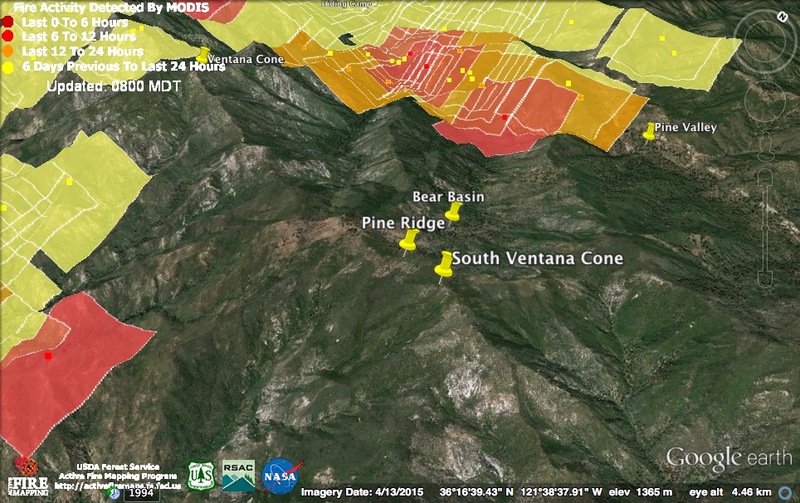 This fire will likely burn on toward Pine Ridge and South Ventana Cone. 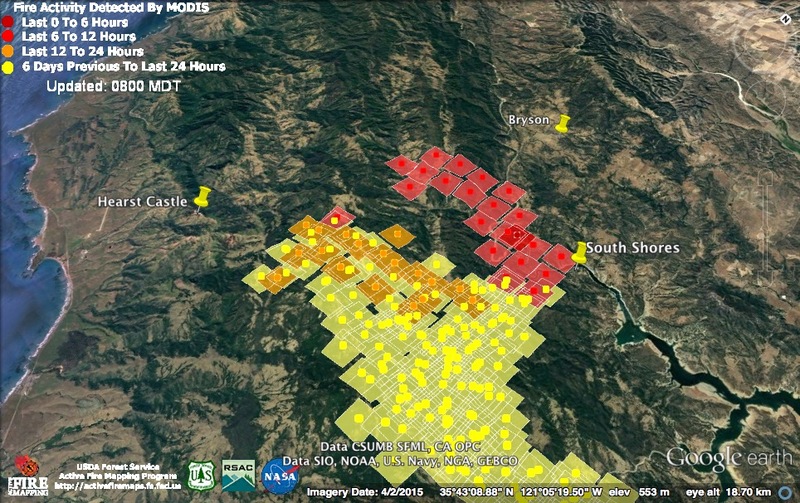 The Chimney Fire’s huge northward run looked like this to the satellites. The good news is that all but one of those heat detections was acquired at 11:30. By 3:00 am things had calmed down considerably. The Chimney Fire is listed as 24,096 acres this morning. Containment, miraculously, remains at 35%. This morning’s official numbers for the Soberanes Fire: 85,212 acres; 60% contained; 57 homes and 11 outbuildings burned; 3 “structures” and 2 outbuildings damaged; 1 fatality and 3 injuries. 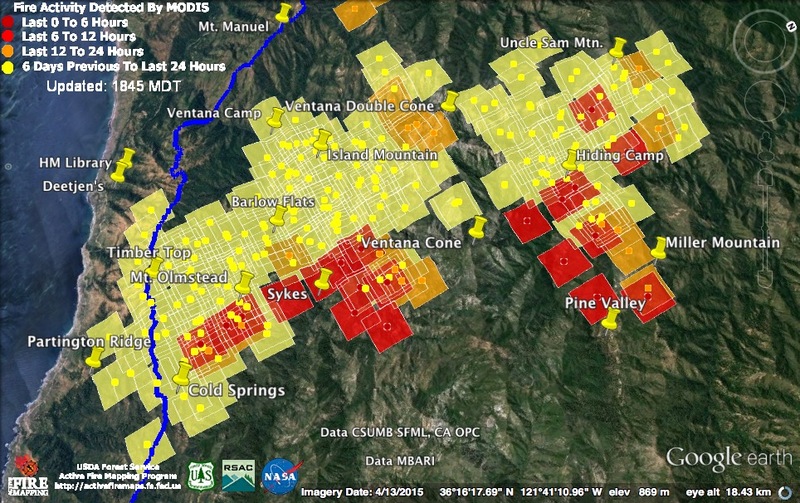 Today’s heat detections were all deep in the Ventana Wilderness. 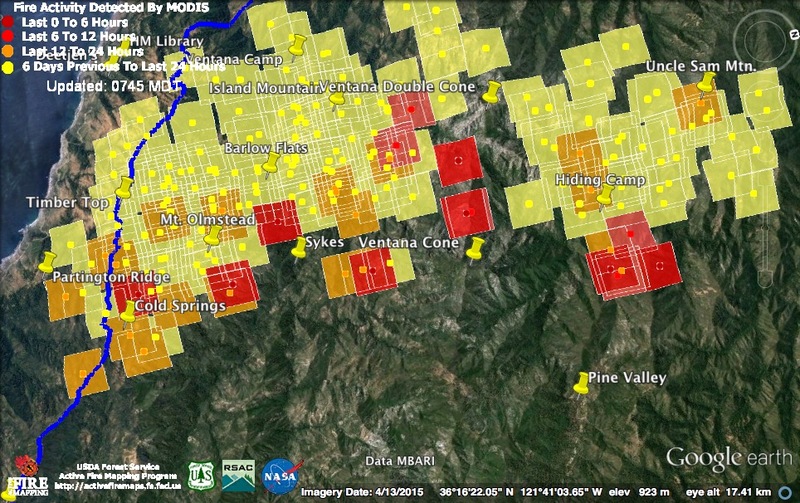 Specifically, near the Ventana Double Cone, near Uncle Sam Mountain, near Hiding Camp, and to the east of the Carmel River between Hiding Camp and Pine Valley. The satellite passes were at around noon and 2:00 pm, though, so a lot could have happened later in the afternoon. It certainly did on the Chimney Fire. 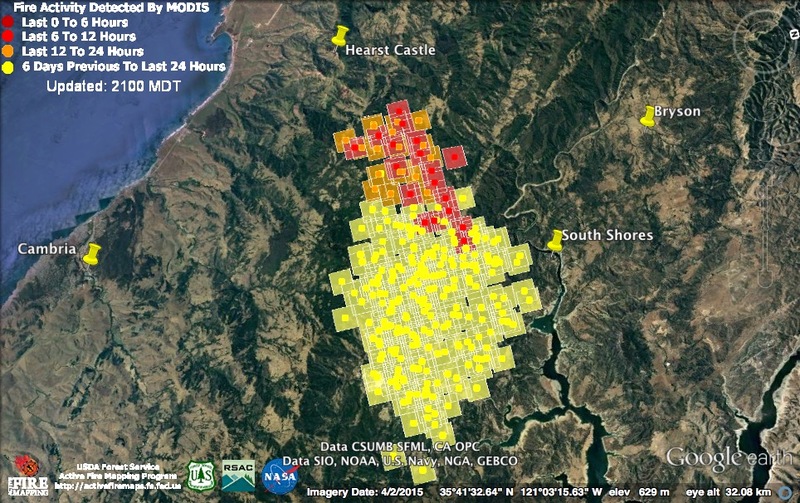 Sometime after the noon and 2:00 pm satellites found heat mainly within the existing perimeter of the Chimney Fire, a south wind pushed the fire across the lake/river to the west of South Shores. There are now a roughly estimated 2,000 acres burning north of the Nacimiento River and everything to Bryson and beyond is under a mandatory evacuation order. A major firefighting effort was undertaken this afternoon to prevent the fire from burning into the South Shores neighborhood. Hearst Castle was also under threat, but the wind is now more favorable and air tankers were able to paint a heavy line between the fire and the Castle before retiring for the night. The fire is now listed as 19,909 acres (a 7,000 acre increase since last night and most of what burned this afternoon has not yet been mapped or included in the total) and 35% containment (the fact that containment percentage often remains unchanged when fires massively increase in size should give you an idea of how accurate and meaningful such numbers are). This evening’s official numbers for the Soberanes Fire: 83,830 acres; 60% containment (amazing how containment has remained always at 60% as the fire has gradually increased in size by tens of thousands of acres); 57 homes and 11 outbuildings burned; 3 “structures” and 2 outbuildings damaged; 1 fatality and 3 injuries. 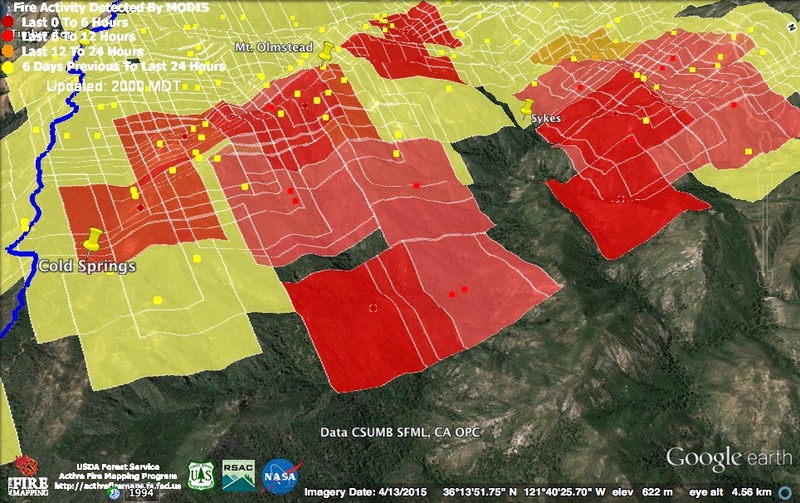 The light red squares represent heat detections acquired around 11:30 pm last night. 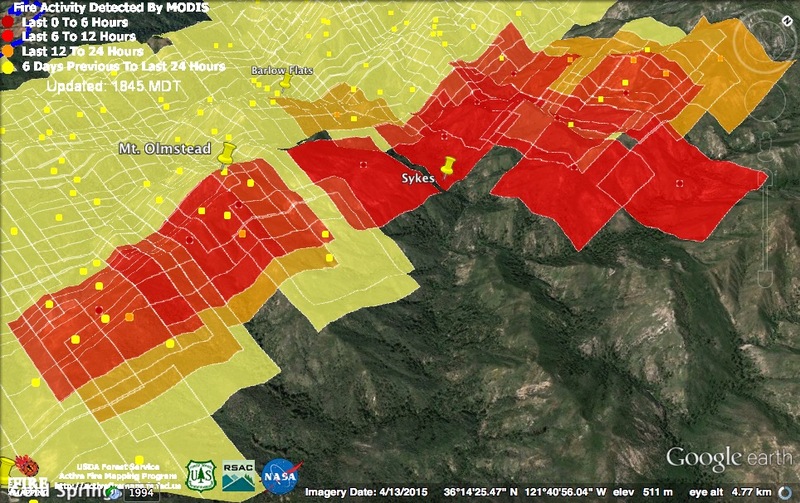 The more numerous dark red squares represent heat detections acquired around 2:30 this morning. 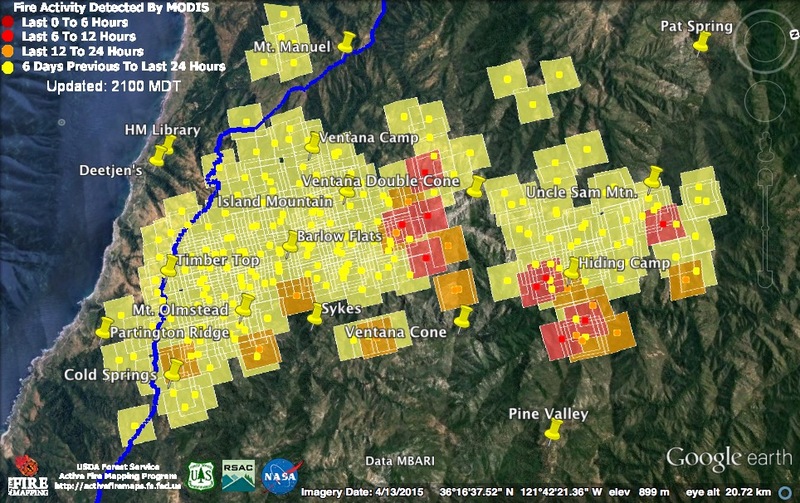 The fire east of the Carmel River was very active overnight, continuing to spread up Hiding Canyon and the ridge to its north, toward Pine Valley, Miller Mountain and, eventually, Chew’s Ridge. Fire also appeared overnight on the high ridge between the Ventana Double Cone and the Ventana Cone. Meanwhile, to the south, the Chimney Fire made a large run to the west during the night. No updates to the official numbers for either fire have been issued yet this morning. The day started slow, but burning really began to pick up this afternoon. A few of the new heat detections (in red) are from 11:30 this morning, but most are from around 3:00 pm this afternoon. It looks like firing operations are progressing south along the Coast Ridge from Cold Springs. 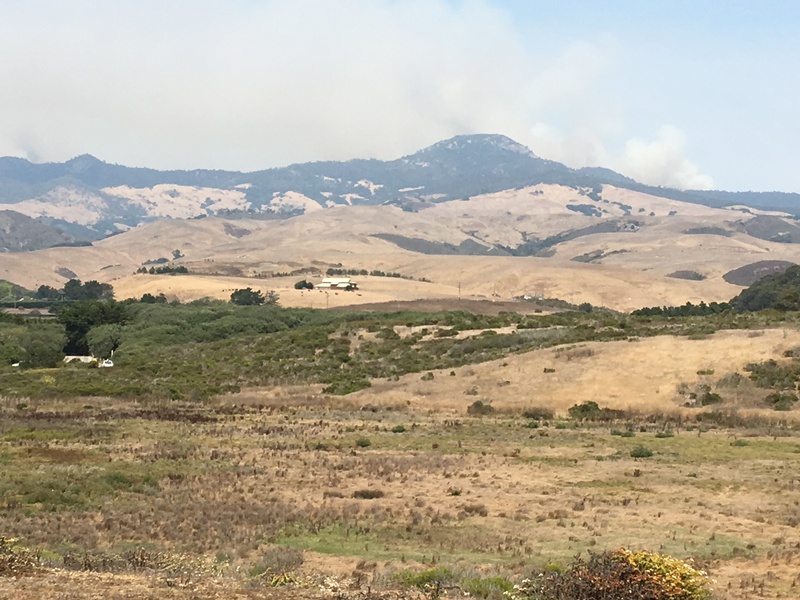 On the back side of the Coast Ridge, fire ignited by the firing operations appears to be actively backing into the Cisco and Mocho Creek drainages. There is, once again, a heat detection on the west side of the line near Partington Ridge, but I was in the area at about the time this heat detection was recorded and saw no sign of fire there, so I think it is probably an error. 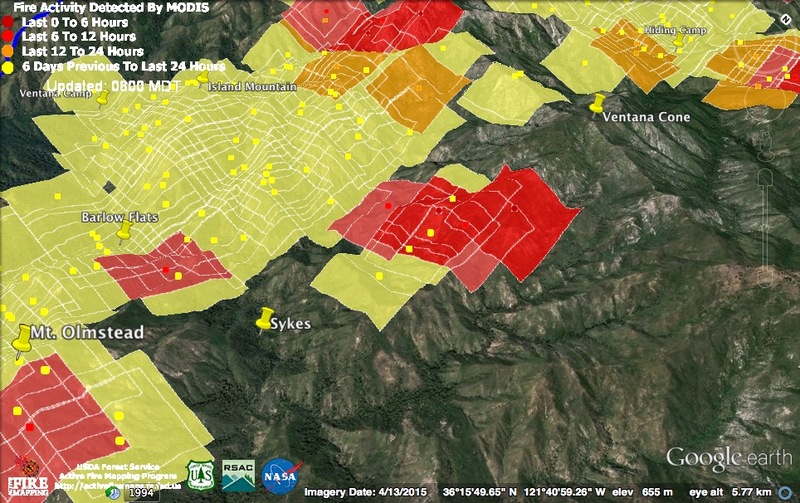 This outlying heat detection from a couple of days ago, on the other hand, does not appear to have been in error (in spite of not showing up on the infrared mapping), as fire now seems to be spreading along the ridge between the Lion and Redwood Creek watersheds (between Sykes and Ventana Cone). Sure enough. The fire this morning’s infrared map placed on the east side of the Carmel River is now running up the brushy ridge toward Miller Mountain and Pine Valley. It was bound to happen sooner or later. 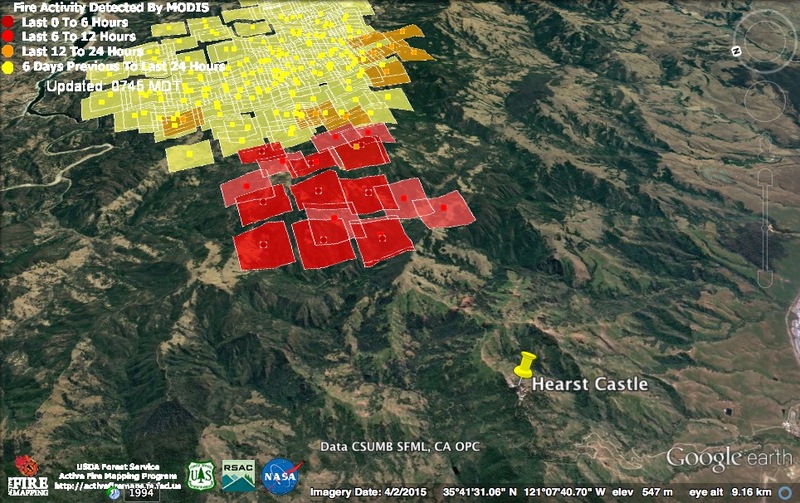 The Chimney Fire, meanwhile, made runs both west, toward Hearst Castle, and south toward Cambria. It is listed this evening at 12,939 acres and 35% containment. The Chimney Fire, as viewed from Cambria at 2:15 this afternoon. The fire is getting closer, but fortunately things are much cooler and damper on the ocean side of the ridge. The heavy marine layer cooled things off even at the higher elevations last night. 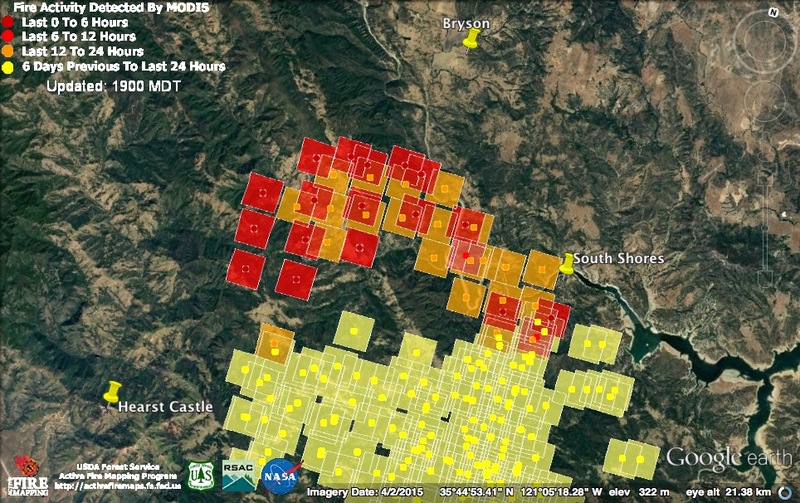 The red squares indicate heat detections acquired around 11:30 pm last night. They are all within the previous fire perimeter. The most recent satellite pass, around 3:30 am this morning, apparently detected no heat over the Soberanes Fire at all. This does not mean that the fire has gone out, of course, just that it was mainly smoldering at that time. This morning’s infrared map, based on data collected around 8:00 pm last night, does not show any heat west of the Coast Ridge fire line near Partington Ridge or anywhere else. 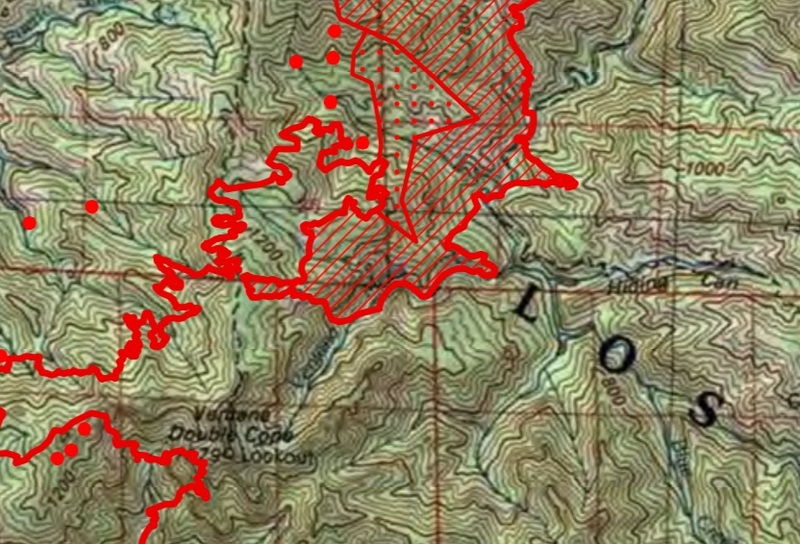 The infrared map does show fire beginning to cross the Carmel River in the Hiding Camp area. The Chimney Fire, meanwhile, continued it’s march to the south and west last night although, it too, cooled off as the night wore on. 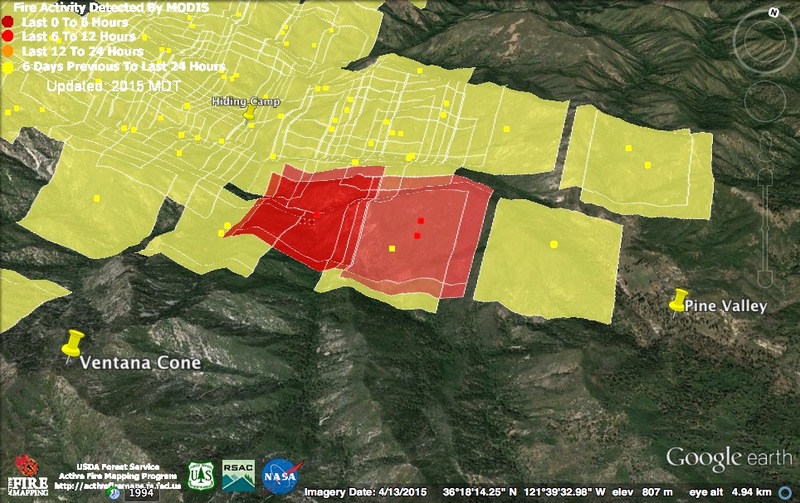 The 3:30 am satellite found heat only deep within the previously burned area. It is listed as 11,999 acres and 33% contained this morning. This morning’s official numbers for the Soberanes Fire: 81,396 acres; 60% contained; 57 homes and 11 outbuildings burned; 3 “structures” and 2 outbuildings damaged; 1 fatality and 3 injuries. This entry was posted on Friday, August 19th, 2016 at 7:38 am and is filed under Uncategorized. You can follow any responses to this entry through the RSS 2.0 feed. You can leave a response, or trackback from your own site. 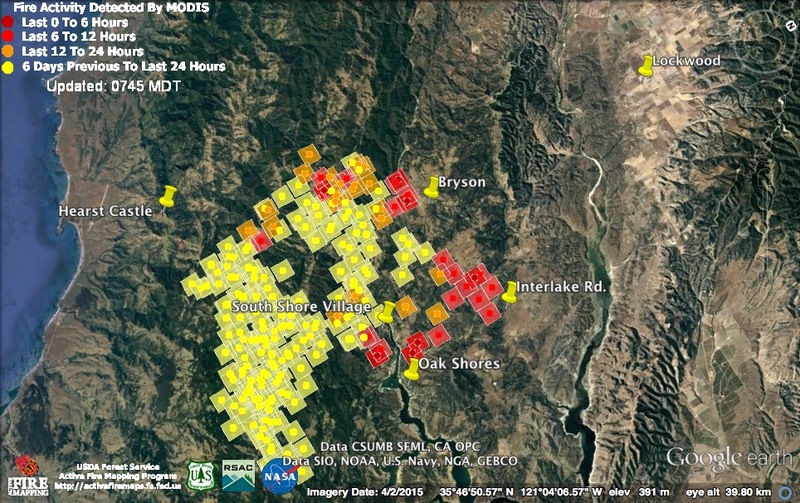 Anyone seeing aerial photos of damage to the area already burned? I tend to believe the containment number of 60% is relatively accurate. They’ve got it bound on 3 sides. The spread is all in the middle, in ridiculously inaccessible terrain. If all the CA resources could be put to this fire, they could probably air bomb water and retardant to complete the remaining side. But there are other fires to deal with, like Chimney and Bluecut. And national resources have to be spread across all the western states on fire. So without additional resources (read, more taxpayer money), they can’t increase the containment number until the fire reaches terrain where they can start to round it in and get at that inaccessible 4th side. An idea to prevent this ongoing spread south in future years (because with climate change, this is just going to keep happening over and over) is to build a fire road from west to east across the wilderness that gives the firefighters a line to defend. “I tend to believe the containment number of 60% is relatively accurate. They’ve got it bound on 3 sides. The spread is all in the middle, in ridiculously inaccessible terrain. If all the CA resources could be put to this fire, they could probably air bomb water and retardant to complete the remaining side. But there are other fires to deal with, like Chimney and Bluecut. 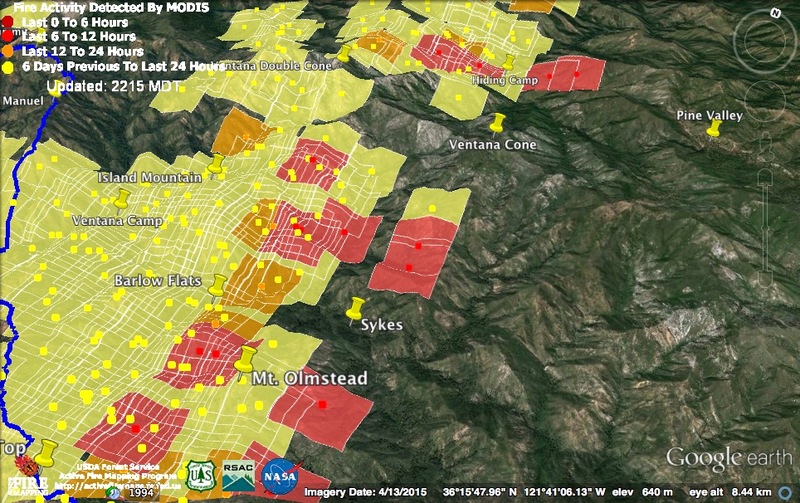 And national resources have to be spread across all the western states on fire. The devil, as always, is in the details. The currently planned/opened southern line from Rodeo Flat to the Memorial Park is mostly an old road, and not ideal for a control line, but at least it has been used before and can be reopened without putting yet another scar on the land. As far as I can tell, the topography does not admit any west to east alternatives farther north that are much better. The only possibility I saw from looking the historical (1994 and before) Google Earth imagery would be to string together the old pre-attack lines that cross the Marble Peak Trail and traverse Black Cone. Unfortunately there is no good ridgetop route for this line from BM 3537 though Indian Valley to the North Coast Ridge Road and in the years in which it was used (or at least opened) it apparently just followed the trail for much of that segment. Reopening this line would put dozers in places where they have not been seen in decades. If you’ve witnessed the weed infested inverse Mohawk haircut that the dozer line from the Turner Creek/Big Pines junction to Devil’s Peak became after the 2008 fires, you might understand why I hope that these long-unused pre-attack lines along the Marble Peak Trail (and elsewhere in the Ventana Wilderness) are never dozed open again. Fire damage heals. Dozer scars don’t. On a totally unrelated note, I guess that with the fire finally making it to Sykes Camp the last of the wilderness toilets will succumb to the fire. A couple of weeks ago several volunteer wilderness rangers assembled for a mission to wrap the toilets, but the mission was cancelled when the fire breached near Cabezo Prieto and Mt Manuel. Oh well, the toilets can be replaced. 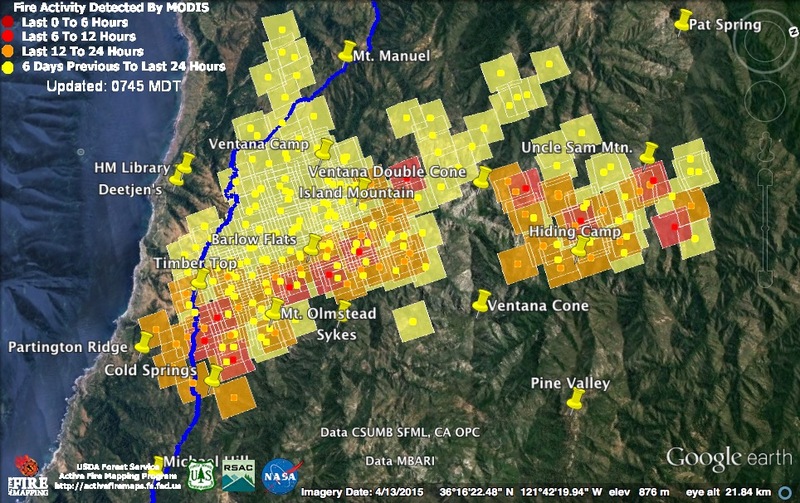 I kinda hope the Big Sur River corridor remains closed until that happens. I agree with Mike Heard about the Bull Dozer lines. 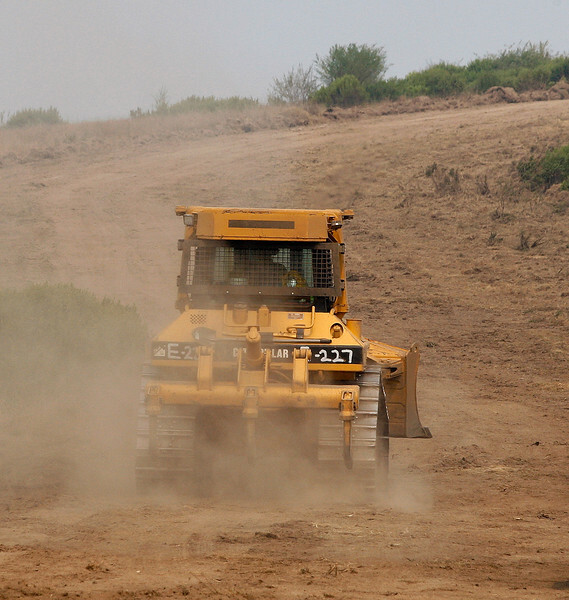 I know of bulldozer scars from the 1950s & 60s which have never healed in Southern California. The photographs I’ve been seeing with regards this Soberanes Fire shows massive bulldozer scars which are 5 & 6 blades wide. Most people do not understand the underground microbial dynamics and how things can chage from a mycorrhizal fungal one to a bacterial one. The bacterial one favours the non-native invasive weeds. The mycorrhizal soil system favours, chaparral, trees, perennials etc. Here is an example of the cuts I am talking about. And guess what, the fires have blown by many of these and the damaged from scaring is done. Probably will last for centuries. Below is an example of what happens to bulldozer lines from this fire break along ridgetops of the Trabuco Wilderness in Cleveland National Forest in Orange County California. These non-native, non-mycorrhizal weeds (Ruderals) act as an ember magnet from fires a mile away. They burn like gasoline and spread fires much faster than chaparral. 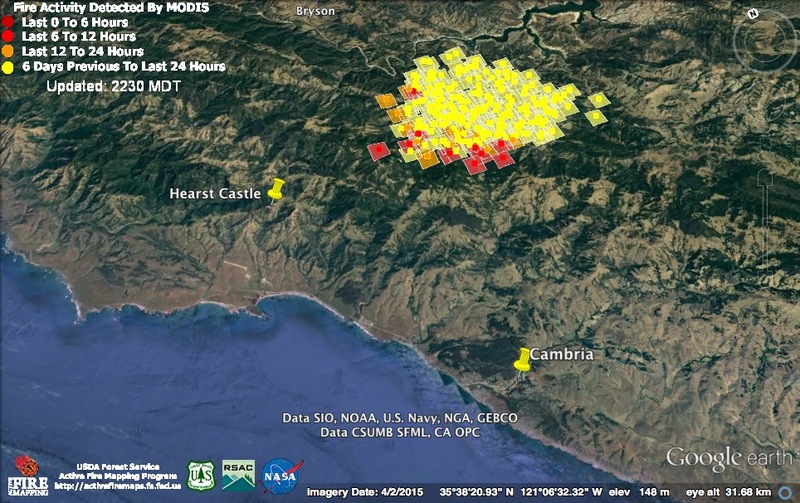 How many miles apart is the Chimney fire from soberanes? Fascinating information provided by earthsinterface. Thanks for sharing. 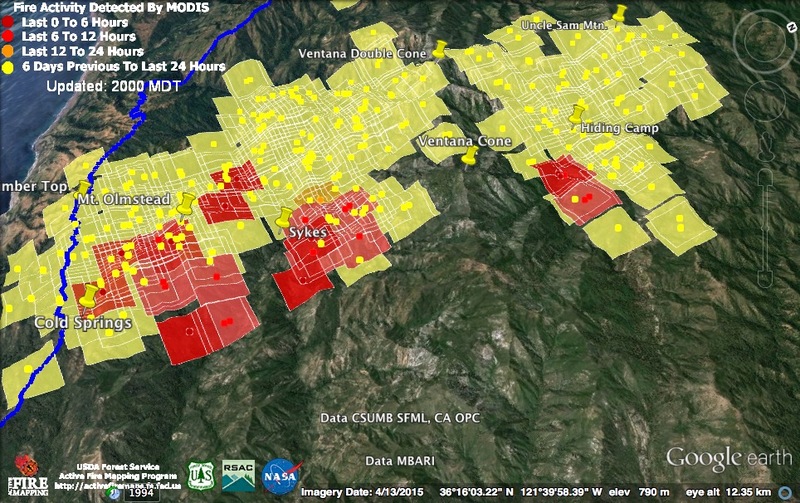 Mar: The northern edge of the Chimney fire is about 40 miles more or less from the southern, Coast Ridge edge, of the Soberanes fire.